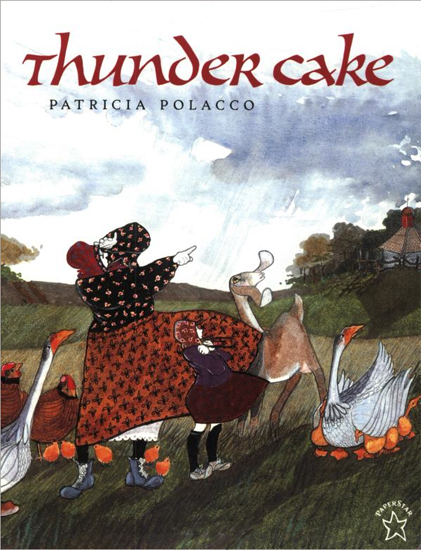 Patricia Polacco is another author whose books became touchstone texts in my classroom. Her ability to write stories that children can relate to makes it easy to see why her books became model texts. A lovely story about the relationship between the author and her grandmother. The child in the story is afraid of thunder. Babushka (her grandmother) helps her overcome her fear of thunder by distracting her during a storm. As a result she shares a special time with her grandmother and learns something about herself. Lesson idea: Create a large t-chart. On one side, label Text and on the other label Self. As you read aloud, stop and model for students various points that connect the text to your life (or your childhood). Perhaps, spending time with a grandparent, fear of something, baking, etc. In the column for Text, note what happens in the text that creates the connection. In the column for Self, note the connection. Provide other books that lead children to make text-to-self connections. Many Cynthia Rylant books offer themselves to this comprehension strategy. Have students read them in pairs or small groups and discuss their text-to-self connections. After students become familiar with this strategy, encourage them to make text-to-self connections as they read independently. **Note** I provide these lesson ideas under the assumption that you are familiar with teaching comprehension strategies. If you are not, and would like more information about teaching Text-to-Self Connections or any other comprehension strategy, please feel free to contact me at Dlittle[at]linkstoliteracy[dot]com. I am happy to provide more specific lessons if necessary. Do you have any touchstone texts or touchstone authors in your classroom?